School can be a dirty word when it comes to PANDAS/PANS. Or it can at least be preceded by a few choice words whenever it’s discussed. This “PANDAS School Daze Series” will hopefully provide some good tips on making the school year a bit easier. Lesson 2: Symptoms at School. PANDAS/PANS children will exhibit a multitude of symptoms that vary from child to child. Unfortunately, the symptoms can look behavioral or like a mental illness…but PANDAS/PANS is a MEDICAL condition. The child does not actually have OCD, Tourette’s, ADHD, Anxiety, or Oppositional Defiance Disorder (ODD), etc…. These children have PANDAS/PANS, which causes BRAIN INFLAMMATION and the symptoms are a result of issues in the Basal Ganglia, the conductor of the body. It can be difficult Talking to the School about PANDAS/PANS Symptoms. It’s not easy to explain to a teacher that the rage your child just had happened because they probably interrupted one of his rituals. Or that it’s not defiance when your child refuses to sit on the floor during circle time, but it’s her OCD and contamination fears. And when you are dragging your child into school…TARDY AGAIN…because sensory issues meant that it took an hour for your child to get dressed. It might be easier to be a class clown as a way to cover up vocal tics. ADHD issues can keep a child fidgeting and unable to focus to do his/her work. Making many trips to the bathroom is not a PANDAS/PANS child’s way to get out of work, but it could be an overwhelming, frequent urge to “go” or a handwashing compulsion. Intrusive/Inappropriate thoughts can also be an issue, and all too often children do not want to even talk about them. There are so many examples that could be listed here. Sigh. Our children are sick, even if they do not always look sick. PANDAS/PANS is Medical NOT Behavioral. You wouldn’t punish an epileptic child for having a seizure. You wouldn’t punish a diabetic child for needing insulin. You wouldn’t punish a child with a broken leg for not being able to run in gym class. You wouldn’t punish a child with a severe peanut or other food allergy for going into anaphylaxis. You wouldn’t punish a child suffering from a concussion for any confusion or loss of skills. PANDAS/PANS children do not deserve to be punished for their symptoms. Yes, the behaviors need to be controlled, corrected, and addressed at school…but there also needs to be a lot of understanding. PANDAS/PANS is an assault on a child’s brain. It is unfortunate that many of the symptoms seem behavioral or would be considered a mental illness. But PANDAS/PANS has a MEDICAL cause…BRAIN INFLAMMATION. The condition is no less real because the cause is mostly invisible. In fact, invisible illnesses require more understanding and compassion, which isn’t always easy but is 100% necessary. Oh, and according to the Free and Appropriate Education Act (FAPE), understanding and accommodation is required by law. Yes, PANDAS/PANS symptoms are confusing. Yes, they’re sometimes disruptive to the classroom. And yes, sometimes the child seems fine and then “loses it” for no apparent reason. But it is also a child’s BRAIN INFLAMMATION that causes these symptoms. All of this is a result of their immune system being triggered and creating an autoimmune reaction. In other words, their body attacks their own brain because they came in contact with germs. Imagine how it must feel for the PANDAS/PANS child to not be in control of his/her actions. In some cases, the children may not even remember the events that took place. I have read comments from parents who have said that the schools accuse their children of faking their symptoms. In other cases parents are told that their child’s issues do not qualify for special services because they look fine or the effects are transient and not constant. OMG! This is just so NOT OKAY!!! Grrrrrr! But I will also say, that sometimes kids are just gonna screw up. ALL kids…including our PANDAS/PANS children. We cannot expect them to be angels. Nope. So while it might not always be PANDAS/PANS symptoms causing issues every time at school, it is difficult to tell what’s what. In my son’s case, I struggle at times to determine whether it’s PANDAS, brattiness, giftedness, or 100% age appropriate behavior (it’s been a very long time since I was 10). I have developed a pretty good PANDAS symptom radar by now though, and I can usually at least cull that out of the mix. Learning opportunities are always going to happen with the other types of behaviors. But there is always so much guilt when I realize he was punished for behaviors over which he had little to no control. Sigh. Symptom-wise, Obsessive Compulsive Disorder/OCD is a KEY component in PANDAS/PANS. Many people think of OCD as excessive handwashing or checking locks on all of the doors. It can also be rituals and compulsions, magical thinking, inappropriate thoughts/intrusive thoughts, perfectionism, rigid thinking, and “just right” behaviors. In some cases, OCD may look like defiance because children may hide the real issue. It’s also important to realize that PANDAS/PANS do NOT actually have classic OCD (or other symptoms either). It is the BRAIN INFLAMMATION that causes the issues to flare, so typical treatments usually will NOT work. Some therapies like Cognitive/Behavior Therapy/CBT or EERP may help with residual issues but not during an exacerbation. These articles are very helpful when explaining what OCD looks like in a young child and at school: “OCD in a Young Child” and “OCD at School“. The book Freeing Your Child from Obsessive-Compulsive Disorder: A Powerful, Practical Program for Parents of Children and Adolescents by Tamar E. Chanskey, Ph. D also has a section about PANDAS. And Beth Alison Maloney’s books are good school resources: Saving Sammy: A Mother’s Fight to Cure Her Son’s OCD and Childhood Interrupted: The Complete Guide to PANDAS and PANS. Tics are another main symptom of PANDAS/PANS. Tics may be either motor or vocal in nature. Verbal tics may make it difficult for a child to “be quiet” in the classroom and may be seen as an attention-seeking behavior. Motor tics will vary considerably with effects seen in schoolwork accordingly. (For example, a head nodding tic could affect any reading assignments.) Some children may find that their tics increase at school when they are under time pressures (tests), have anxiety/stress, if they are tired, or if they are in a stimulating environment. Tics may decrease when the child is distracted, in a new environment, or when a child is fully engrossed in an activity. Teachers, school personnel, and other students must realize that the tic is not something the child can control. We have really only dealt with a few minor tics (motor and vocal) off and on during our PANDAS journey, but for some kids, tics are a major issue. This article does a decent job talking about tics at school. When it comes to school, you are most likely going to see symptoms falling in the following categories: Behavioral, Physical, Academic, and Executive Function. (Note: Smart but Scattered: The Revolutionary “Executive Skills” Approach to Helping Kids Reach Their Potential is an excellent book about Executive Function.) It is important to remember that ALL of these symptoms have a MEDICAL cause (BRAIN INFLAMMATION!). Providing information and doctor letters can help. You may find that it is easier to go with more common diagnoses with wider recognition (ADHD, Tourette’s, OCD, etc…) than it is to get school accommodations with PANDAS/PANS. The medical needs for any special services can be addressed with your doctor and the educators if an IEP/504 Plan becomes necessary. Anecdotally, there are many gifted kids with PANDAS/PANS, which means that some of the Academic issues can be brushed aside because they are already advanced. Losing skills may bring them to average, which isn’t failing and may not bring much alarm to the school. This is ridiculous. ANY loss of skills for any child at any level should be met with concern. A math whiz who suddenly can’t do simple addition because of BRAIN INFLAMMATION needs to have this loss recognized and accommodated as a medical symptom. And as far as Executive Function, you can just try harder to be organized when your Basal Ganglia is being squeezed inside your skull. The Physical symptoms are probably going to be noticeable. The Behavioral ones are going to really be noticed and likely get you lots of opportunities to discuss PANDAS/PANS with the school. It can help to identify and share those PANDAS/PANS symptoms your child seems to mostly exhibit. By talking to your child’s teacher(s), you can also find out if there are behaviors that happen at school but not at home. (My son’s symptoms mostly manifest at school. I think it is due to being exposed to so many people and germ opportunities.) The more information you have the better in tracking your child’s progress/healing/recovery or deterioration/severity of illness. And teachers can also begin to watch for physical symptoms that a meltdown is coming or notice when anxiety is increasing. Proactive measures to keep a child feeling safe can go a long way in helping him/her self-regulate. Knowing your school understands the issues can help keep you, the Parents/Caregivers, calmer during the school day too. School information can also be given to your pediatrician or PANDAS/PANS Specialist for their medical records. Refuses to do school work – reading, writing, math. 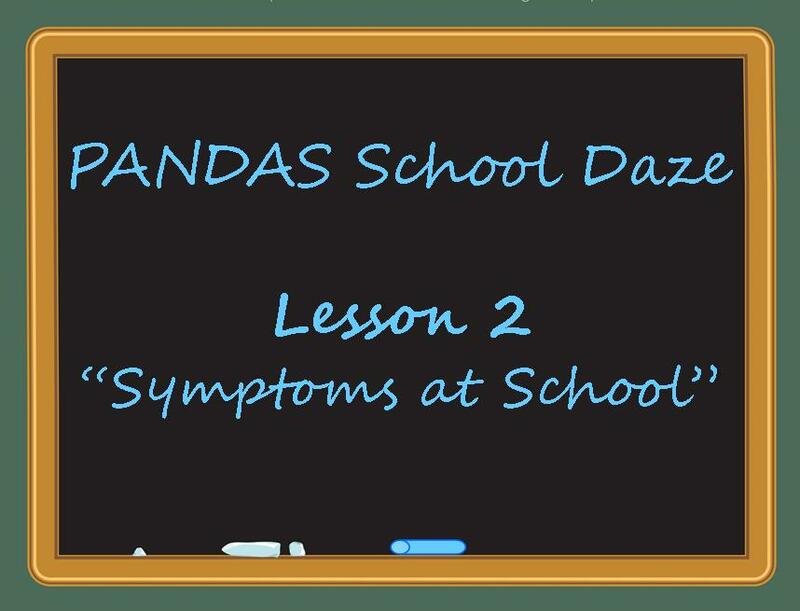 Hopefully, the list of PANDAS/PANS symptoms will help you with your discussions at school. Any major symptoms missing? 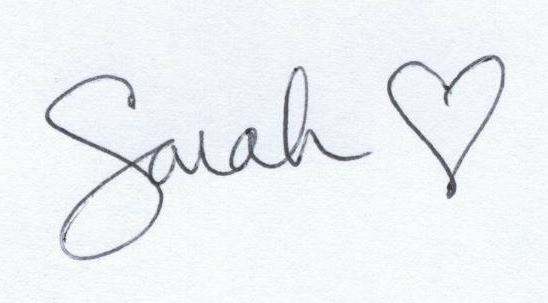 If so, leave a comment or send me a message so I can add them. Next up in the PANDAS School Daze Series, we’ll talk about why schools need to care about PANDAS/PANS and how the condition may affect child’s educational career with Lesson 3: Impacts on Learning. You might also like Lesson 1: Talking to the School.